Traffic: Train lengths on the network were limited to 8 carriages or wagons and a maximum length of 50m. A short section of the network, the line from La Nouvelle to Port La Nouvelle carried a significant summer passenger traffic. Otherwise, the network carried the usual range of customers for a line of local interest: farmers, winemakers, commercial travelers, etc. From its opening, the network was well patronised. However from 1920, some lines began to see a drop in traffic. Those which continued to see a good level of traffic were those considered to be the ‘main’ lines of the network. Then following table shows these differences and is based on a period of 4 months in 1926. The main arteries (Lines 1 and 3) have good traffic. The lines in the “suburbs” of Narbonne and Carcassonne (Lines 2, 10, 11 and 12), had high traffic levels, the remainder struggled. The commissioning of railcars, however, brought a marked improvement in the number of passenger trains and passengers. This improvement, was spectacular – a 26.5% on the figures of the previous year! Passenger services: From their opening, the service on each line was provided by means of three daily return trips, except on the Lézignan to Olonzac section (line 1) where there were four round trips. The overall average speed was between 14 and 20 km/hour which equated to a line speed (stops deducted) of between 16 and 25km/hour. The maximum line speed was intended to be 20km/hour. During the Great War, the staff was partly mobilized for the war effort and the company was obliged to reduce the frequency of services to a daily return, except on the Narbonne-Ouveilhan line (Line 11), and on some sections of the Lézignan-Carcassonne Line (Line 1) and Lézignan-La Nouvelle Line (Line 3) where two round trips were maintained daily. Due to the poor condition of the equipment and track, travel times increased considerably on each line. After the war, the service improved quickly. From 20th March 1920, three daily round trips were secured on Lézignan-Félines section of Line 1, and Lézignan-Fabrezan section of Line 3, while on the rest of the network, two round trips daily allowed a good passenger service. In 1924, the commissioning of a Berliet railcar gave the opportunity to appreciate the flexibility and advantages of these vehicles. In July and September 1926, Dion-Bouton railcars were put into service on Lines 1, 3, 8, 9, 10, 11, 12, allowing the lowering of travel times on these lines. 1st January 1933 saw the end of all services. Goods services: The network carried a large quantity of straw, fodder, wine in casks. From Felines to Termenes, complete trains expedited the transfer of minerals from the mines of Villerouge and dAlbas. On the Carcassonne-Lastours Line, other ore trains came from the Caunette mines. Off Line 2 – a branch to Société des Mines de la Caunette. Off Line 3 – branches to Société des Mines de Villerouge and Albas. Off Line 3 – various small businesses. Off Line 6 – a branch to a company owned by M. Estrade. Off Line 6 – a line to a Ballast quarry. Off Line 9 – a line to the Ballastiere de Ripaud. Very few trains were exclusively ‘goods’ trains. Most traffic was provided by ‘mixed’ trains. At the Gare des Palais (Line 3) a specially arranged set of tracks served as a marshalling yard for freight services for the “Corbiéres Group” of lines. The presence of a yard of this nature on a secondary network is rare. The Tramways de l’Aude had transfer facilities with the Compagnie du Midi, in Carcassonne, Lézignan, Narbonne, Castelnaudary, Bram, and La Nouvelle. The network also had connections to the Canal du Midi, the largest of which, La Gare de Estagnoi was located in Carcassonne. Finally, on the Mediterranean, the network had a port which put the network in contact with cargo ships loading at Port-La Nouvelle. Personnel: The network employed 439 staff in 1912 and 453 in 1913. In May 1924, before the network started to downsize, it had 510 staff. That number had dropped to 476 in July 1924. In 1910, each train included: a conductor, a mechanic, a driver and a brakeman. Equipment: The loading gauge was 2.20m wide, 3.50m high. The rolling stock had a single central buffer, coupling used 2-screw couplings. Locomotives: the network initially ordered 35 traction units: 0-6-0T steam locomotives, tare 17 tonnes, load capacity 21 tonnes; steam railcars, Rowan type, combined passenger-goods. The company, however, abandoned the idea of railcars and purchased 35 Corpet-Louvet 0-6-0T 16.5 tonne locomotives. This number rapidly became insufficient. 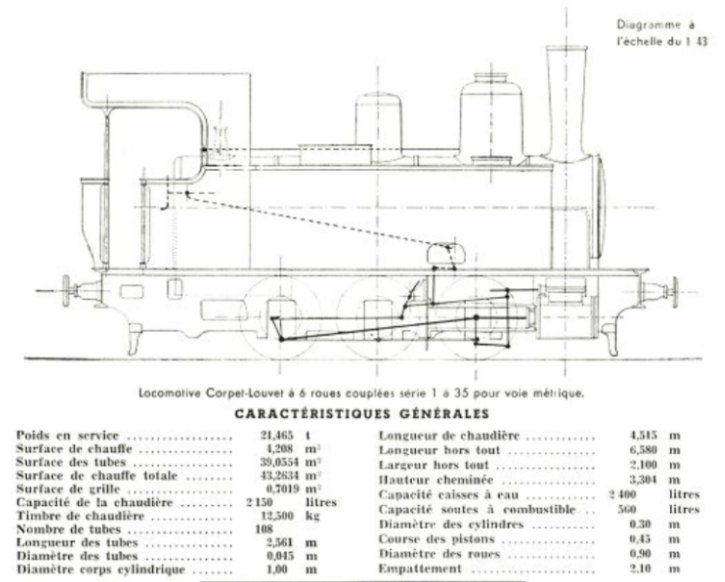 Three further Corpet-Louvet, 0-6-0T, 19 tonne locomotives were purchased in 1908 and a further 3 Corpet-Louvet, 0-6-0T, 17 tonne locomotives were purchased in 1914. This completed the provision on the network. During the war of 1914-1918, the locomotives were not maintained, and one after another they failed. A team of German prisoners was assigned to the network’s workshops and undertook repairs. But locomotive condition deteriorated quickly and by December 1918, only 21 out of 43 locomotives were in working order. These types of locomotives were widely used throughout France. Coaches and wagons: Passenger cars are of the classic type CFIL: two axles, two end platforms. Numbering 76, they are divided into cars of first class (APf and APo) and second class cars (BPf and BPo); tare: 4,500t. These cars come out of the workshops of the ‘SA of Carrosserie Industrielle’. A first series is recognized by enclosed end platforms, while the second series has the classic open platforms. The goods equipment is also built by the ‘SA of Carrosserie Industrielle’. From its inception, the network had 298 wagons distributed as shown below but, as with the locomotives, this allocation quickly became inadequate and in 1908 a further 100 wagons were delivered to the network. The towed equipment also suffered from very poor or non-existent maintenance during the war. Also, between 3rd May 1921 and 31st December 1923, it underwent a total revision. 29 vans, two axles, series Dfs, 1 to 29 (these vans have a window in end). 145 flat wagons of two axles, series Hfr and H, Nos. 1 to 145, payload 10 tonnes (these flat cars have a gallery at one end). 65 open wagons of two axles, series Ifm and l, Nos. 1 to 65, payload 10 tonnes (these do not have a ridge cross-member). 6 flat wagons of two axles, series L, 1 to 6, payload 10 tons (specially designed to circulate in pairs and so allow the transport of loads up to 12-13 m in length). This image was taken at Saissac. It shows three rail vehicles. The one on the right is a covered, windowed wagon, series K1to K53. The two coaches are difficult to make out properly but one at least appears to have closed end platforms which suggest it came from the first batch of coaches bought by the network. Railcars: On 1st July 1923 Les Tramways de l’Aude ordered a petrol powered self-propelled car from Ets Berliet in Vénissieux. This 40 hp, 30-seater self-propelled vehicle came into service as soon as it was delivered at the end of 1924. Satished with the service provided by the railcar, the Company ordered from Ets of Dion-Bouton, on 3rd July 1925, a series of five similar railcars and on 3rd February 1926 a sixth unit. The first five entered service on 4th July 1926; the sixth, in 5eptember1926. These railcars were mounted on the De Dion-Bouton JB type 2 chassis. They had a front bogie and a rear axle engine. The 4 cylinder engine provided 65 hp. The Dion-Bouton Autorails were of an overall length of 9.78m, body length of 8.88m. The passenger compartment was 3.99m long, the luggage compartment, 2.90m. The capacity was 16 seated and 14 standing. So, Lacombe says, Judge for yourself: On 28th December 1910, the train for Olonzac painfully climbed the coast of Felines, with a strong head-wind in the storm. But the Corpet-Louvert 0-6-0T reached the top of the gradient despite the strength of the wind. 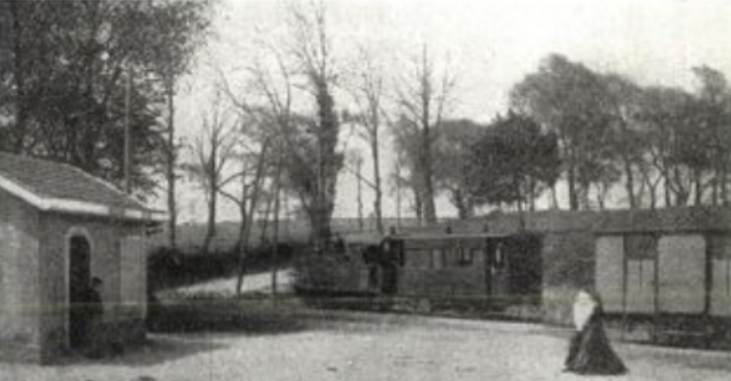 However, on the last curve before the pass which separates the departments of Aude and Herault, and 50 m from the summit, the train suddenly exposed its flank to the enemy and the three passenger cars and the van overturned against the embankment. C. Lacombe; Les Tramways de l’Aude; Loco-Revue No. 212 – LRPresse, November 1961. C. Lacombe; Les Tramways de l’Aude; Loco-Revue No. 213 – LRPresse, December 1961.
http://forum.e-train.fr/viewtopic.php?p=71314&sid=719c2f2983cde0e9d38a1b8414d130c2, accessed on 31st August 2018. This entry was posted in Railways and Tramways of South-Western France, Railways Blog on September 1, 2018 by rogerfarnworth. 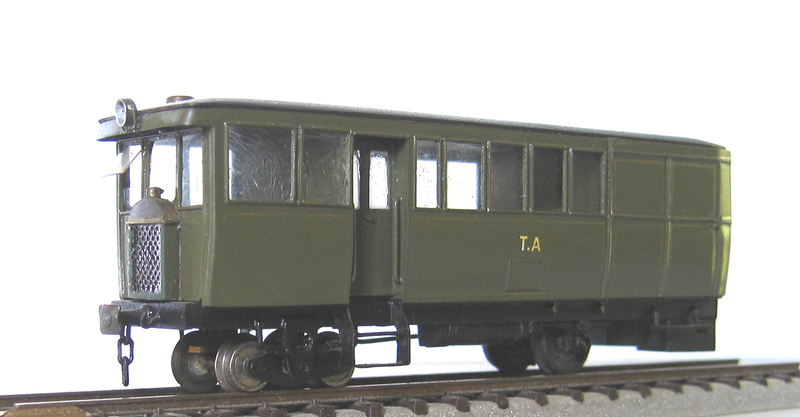 I am the author of the model of De Dion railcar published above here. I think it would only be fair of you to mention my name : “Michel Viers”. Yes Michel, of course it would. My apologies the image came up in an internet search and I should have pursued this further before posting. Please accept my apologies. I can credit the image or remove it whichever you prefer. I will credit it now but if you would prefer it removed, please let me know. It’s all right now. Thank you.